Professor Thesaurus” (teacher Marc Koenig) setting the spelling challenges to students. 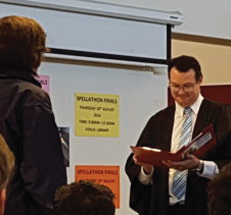 After weeks of preparation, study and inner-class heats, it all came down to the Bentleigh Secondary College Spell-a-thon Finals held on Thursday 7th of September. Students were put through their paces in the competition by teachers Suzy Watt and “Professor Thesaurus” Marc Koenig (no doubt influenced by Channel TEN’s Spelling Bee program). Starting with a warm-up round of relatively easy to spell words to settle the nerves, students from a variety of classes tackled a plethora of words until each class produced a clear first, second and third place winners. Operation Cleft would like to thank teachers Dr. Intha Chetty, a member of the Rotary Club of Moorleigh Moorabbin, for organizing this event, along with Suzy Watt and Marc Koenig for their excellent hosting, Marge Chegwidden for her support and the students of Bentleigh Secondary College for their participation and wonderful fundraising efforts. Dr Intha Chetty, Coordinator of Bentleigh Secondary College’s literacy program.